Clark Stationery - Dabney Lee - Acapulco. Go to Ivy + Anchor for all designs and monogram/color options. Item Name: Acapulco. Go to Ivy + Anchor for all designs and monogram/color options. Description: Personalize your cell phone with these stylish, customized cell phone covers. 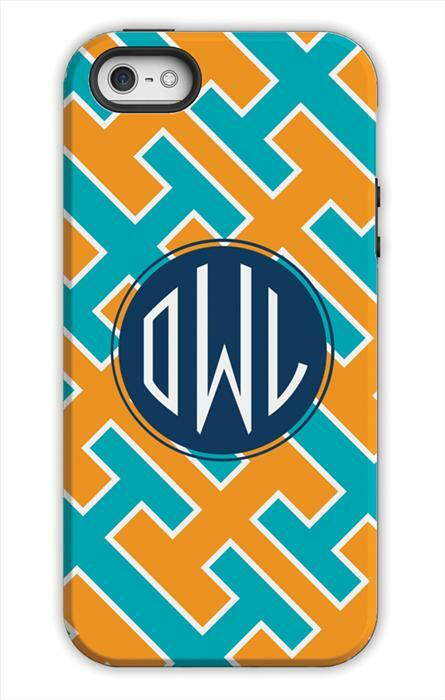 This design allows you to choose from 4 personalization styles: Circle Monogram, Diamond Monogram, Initials or Script Name in a color of your choice (fuchsia, hot pink, ballet, coral, warm red, red, perssimmon, tangerine, sunshine, chartreuse, grass, sea, aqua, jewel, mint, peacock, robin's egg, sky, ocean, marine, navy, white, light grey, dark grey, black, beet, eggplant, or chocolate). Great gift for anyone with a cell phone! This design (background colors only as shown) comes in a variety of product types including the Sleek or Tough Iphone 4/4S, I Pod 5, Samsung Galaxy S3, S4, Note, S5. The folding ID case (folding with space to carry ID) for the Iphone 4/4s, 5/5s and Samsung S4. Also in a neoprene laptop sleeve (13" or 15").